On May 13, ２０１２, an anniversary event was held to commemorate the 35th anniversary of the normalization of diplomatic relations between Japan and China, hosted by the Mie Japan-China Friendship Association with the collaboration with Mie University at the Plaza Dohshin in Tsu city. This event was also for the commemorative anniversary for its foundation of the 60th years of Japan-China Friendship Association. At the Special Lecture, Mr. Koichi Kato, a member of House of Representatives of Japan, made a speech on the importance of respecting each other between two countries, which was learned through his experience while working in the Ministry of Foreign Affairs. After the lecture, three international students from China and Japanese students of Mie University had a Talk Session with Mr Kato. 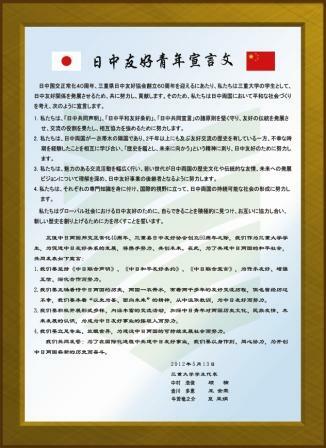 They presented the "Japan-China Youth Friendship Declaration" as Mie University students. In the declaration, they committed themselves to cooperate with each other and to create new history for the friendship between Japan and China. Talk Session "Japan-China Youth Friendship Declaration"